(a) The site should be nearest to the coal mines so that Transport cost of fuel is minimum. (b) Large quantity of cooling (for the condenser) water should be available. (c) The land should not be rocky and marshy. (d) The chimney of the plant, do not obstruct the flying aero planes, i.e., the site should be away from the airport. (e) The site should not be surrounded by residential building to avoid nuisance of smoke, noise etc. (f) If the station is located, near the load center, the distribution cost reduces. (g) Facility for the disposal of ash. (a) Coal and ash handling plant. (b) Steam generator or Boiler. (i ) Feed water heater. (j ) A. C. Generator (or) Alternator. 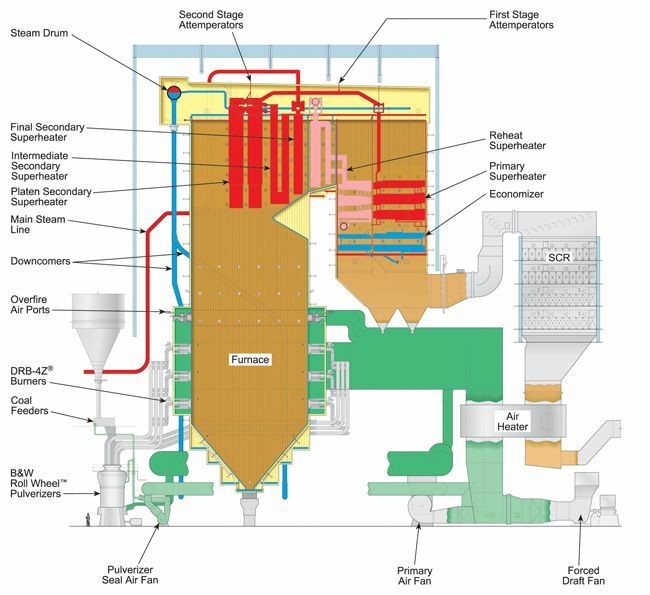 (l ) Electro static precipitator. The coal is transported to the power station by road 'or' rail and is stored in the coal storage plant. The coal is delivered to the coal handling plant. Where it is pulverized (i.e.,crushed into small pieces) in order to increase its surface exposure. Thus promoting rapid combustion without using large quantity of excess air. The pulverized coal is fed to the boiler by belt conveyors. 1. Gives more surface area for a given mass of coal. 2. Fast combustion as more area is exposed to heat and oxygen. 3. Boiler can be started quickly. 4. Fast response to load changes. 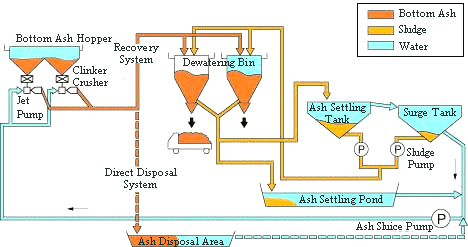 The coal is burnt in the boiler and the ash produced after the complete combustion of coal is removed to the ash handling plant and the delivered to the ash storage plant for disposal. Indian coal has ash content of 20% to 40%. In thermal power plant bituminous coal is used because, it has low ash content. Eg: semi-bituminous coal is more preferable. The water flows through the tubes and hot combustion gases flow over these tube, water tube boiler are used universally for such plant. Features of water tube boiler. The hot combustion gases flow through the tube. Water is surrounded by the fire tube. A super heater is a device which raises the temperature of the steam much above the boiling point of water. 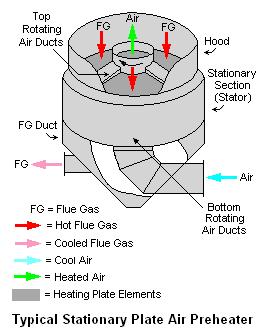 Super heater heat is taken from flue gases. Normal radiant type of heat transfer method is used. It is placed between boiler and turbine. It is improved efficiency of plant. (a) Reduce the steam consumption per given output. (b) Reduce the condensation loss. (c) Elimination the erosion of steam turbine blades due to the absence of moisture. (d) Improves the overall efficiency. 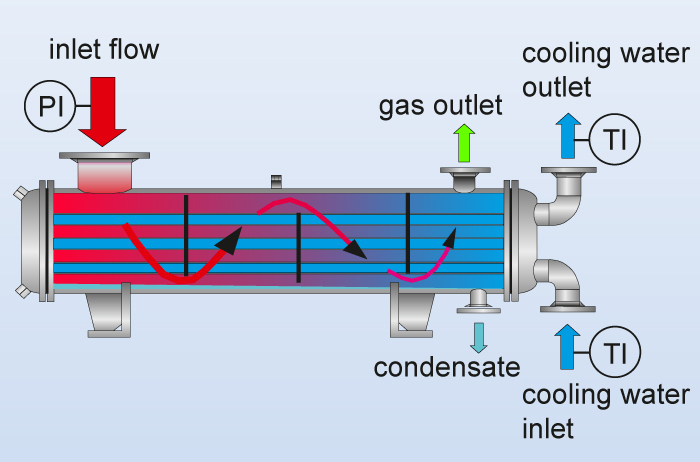 Economizer mainly consists of closely spaced parallel tubes through which feed water on its way to boiler flows and the fuel gases flows outsides the tubes. 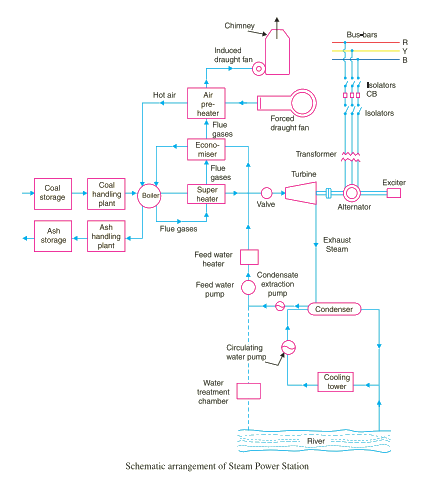 Some of the heat energy of the fuel gases is recovered by heating the feed water hear saturation but, not converted into steam this results saving in fuel (10-25%) and raising boiler efficiency. An Airpreheater increases the temperature of the air supplied for coal burning by deriving heat from fuel gases. Air is drawn from the atmosphere. By a forced draught fan and is passed through air preheated before supplying to the boiler furnace. Air pre heaters are placed in between economizer and chimney. The efficiency of boiler is increased. A steam turbine may be defined as a rotating machine, which converts the energy contained in steam into mechanical energy or rotary energy. The steam expands completely in the stationary nozzles (or fixed blades), the pressure over the moving blades remaining constant, so the steam attains a high velocity and impinges against the moving blades this results in the impulsive force on the moving blades which sets the rotor rotating. 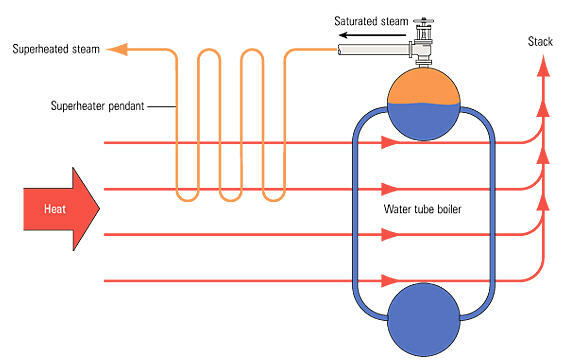 The steam is partially expanded in the stationary nozzles, the remaining expansion takes place during its flow over the moving blades, and the result is that the momentum of the steam causes a reaction force on the moving blades which sets the rotor in motion. 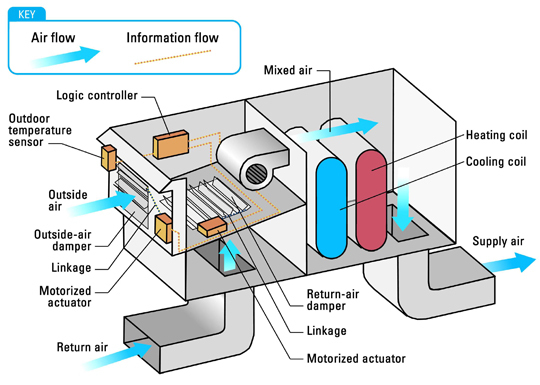 A condenser is a device which condenses the steam at the exhaust of Turbine. It serves two important functions. (1) It creates a very low pressure at the exhaust of turbine, thus permitting expansion of the steam in the prime mover to a very low pressure. This helps in converting heat energy of steam into Mechanical energy in the prime mover. 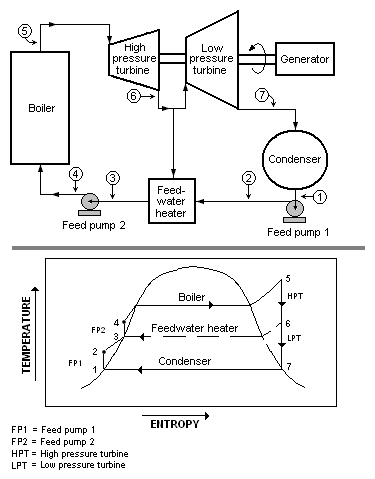 (2) The condensed steam can be used as feed water to the boiler. It is improves power plant efficiency. A condenser is a device in which exhaust steam from steam turbine is condenser and the heat energy given by the steam during condensation is taken up by the cooling tower. The steam coming out of the turbine is condensed and the condensate is fed bock to the boiler as feed water. 1. Feed water heating improved the overall efficiency of the plant. 2. The dissolved oxygen and carbon dioxide are removed in the feed water heater. 3. The quantity of steam produced by the boiler is increased. 4. Thermal stresses due to cold water entering the boiler are eliminated. Each alternator is coupled to a steam turbine and converts mechanical energy of the turbine into electrical energy. Alternator used in thermal power plants are of usually 2-pole (or 4-pole) running at 3000 rpm (or 1500 rpm) for 50 Hz operation. Exciters are nothing but the D.C. Generators their main function is to supply dc power to the field system (rotor). Exciters are mounted on the same shaft of the alternator. 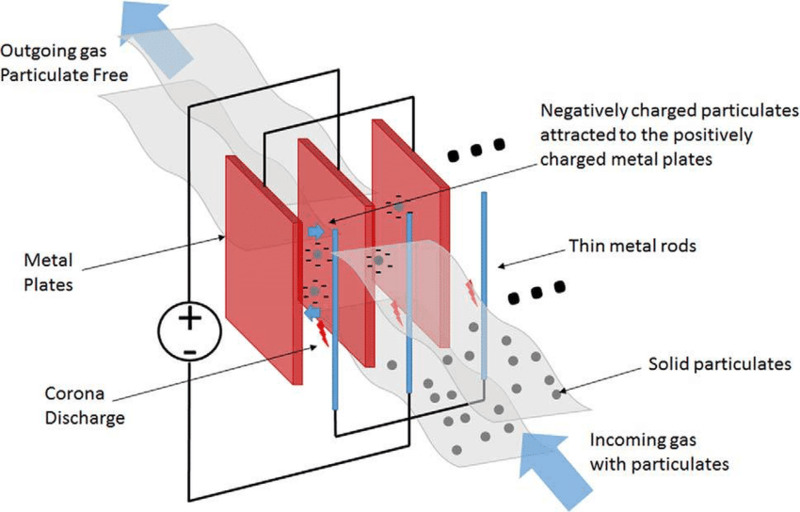 The capacity of the exciter is about 0.5% to 3% of the main alternator capacity. In some cases a pilot exciter may be used to excite the main exciter itself. (l) Electrostatic precipitator:The use of electrostatic precipitator is to remove fine, dust particles from flue gas, It is connected to high D.C. voltage about 30 kV. It is placed between combustion chamber and chimney. (a) Power stations can be located near the load centers. (b) It requires less space as compared to the hydro-electric power station. (c) Requires less transmission and distribution. (d) Long summer will not affect the power generation like hydro power. (b) It is costlier in running cost as compared to hydro-electric plant. (6) Efficiency of steam Power Station: The overall efficiency of a steam power is quite low (about 29%) due to mainly two reasons. (a) Heat loses occur at various stages of the plant. 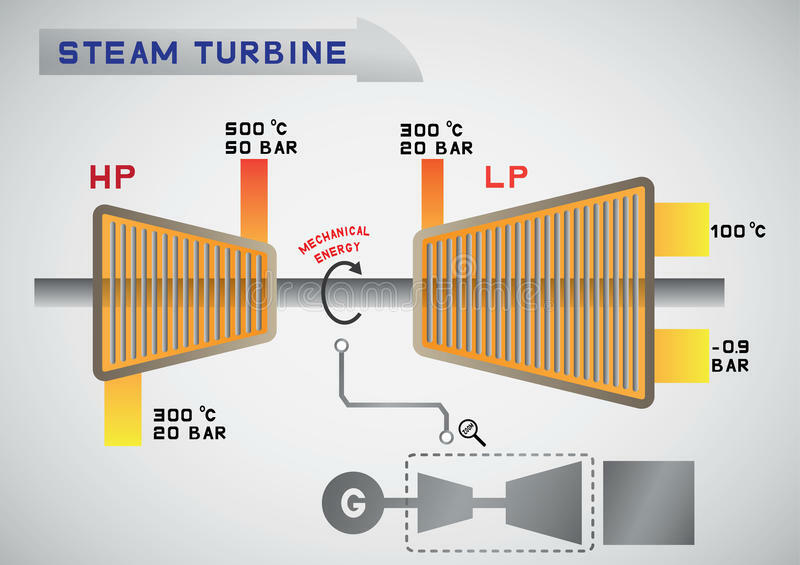 Thermal efficiency:The ratio of heat equivalent of mechanical energy transmitted to the turbine shaft to the heat of combustion of coal is known as thermal efficiency of steam power station.Thermal efficiency thermal. 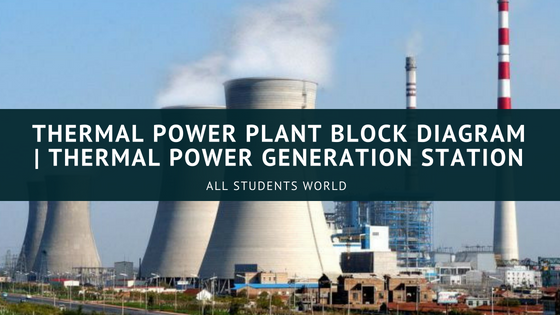 Overall efficiency:The ratio of heat equivalent of electrical output to the head of combustion of coal is known as overall efficiency of steam power station.